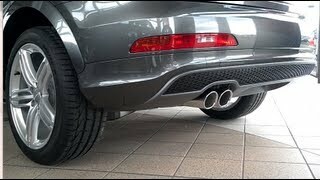 If you are thinking of crossovers then Audi is not a company that comes to mind immediately. That is because; Audi got into the crossover business quite late and haven’t really made an impact thus far with whatever crossovers it has produced. Audi Q7 arrived in the market in 2005, almost three years after the Volkswagen Touareg. The much smaller Q5 was then launched after three years and after three more years it launches the smallest in the family, the Q3. But none of these vehicles have been able to make a mark in the hearts and minds of the auto lovers. But these vehicles have not done badly either. They have just held their ground without any remarkable show in the market. 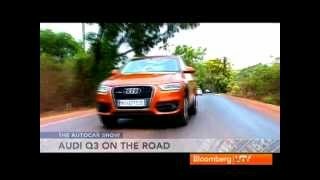 As far as the look of the Q3 is concerned there is nothing fancy about it. But it does look more sensible if you compare it with the muscular Evoque and X1. Overall, the design of the Q3 leaves a little desired to be honest. The face of the car looks quite unusual and different because of the two scowling eyes at the front. The effect gets even more exaggerated at dusk and the car with its lights glowing looks like some fierce animal ready to charge at you. As always Audi has done a great job with the Q3 as far as the size of the vehicle is concerned. At 172.6 inches, the Audi Q3 is 9.6 inches shorter than the Q5 and 27.6 inches shorter than the gigantic Q7. Compared to these two vehicles, the Q3 is also a little narrower, but it is only 2.6 inches lower than the Q5 as Audi wanted to maintain a high-seat driving position. But narrower chassis does not mean a compromise on the spaciousness of the interior. In fact, the interior of the Q3 is almost as spacious as the Q5 or the Volkswagen Tiguan. The Q3 will come with four different engines, which include two 2.0 liter TDI diesels with peak output of 138 and 174 HP, while the gas variants will be powered by 2.0 liter TFSI engines with peak outputs of 168 and 208 HP. 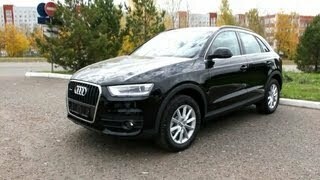 Starting price of the Audi Q3 2012 will be 29,900 euros or around $43,000. The new Audi Q3 is a premium SUV in a compact form. This genuine Audi sets standards in all aspects of engineering - from its body through drivetrains and chassis to its state-of-the-art assistance systems and multimedia systems. The Audi Q3 is a versatile companion for everyday life - with an urbane character. The interior of Audi's latest model is very roomy; its ergonomics and its workmanship are exemplary. Just as for the exterior, customers have many opportunities to express their very own style in the interior: Audi offers a wide selection of materials and colors. The luggage compartment offers 460 to 1,365 liters (16.24 to 48.2 cu ft) of capacity - ideal for sports and leisure. Customers can opt to supplement the standard specification with numerous options straight from the luxury class. Examples include adaptive light technology for the xenon plus headlights, which ideally illuminates the road ahead - even around corners. And an enhanced parking assistant alerts the driver to obstacles, even if they are off to the side. Furthermore, Audi offers an entire set of infotainment components, spearheaded by the large MMI navigation plus - a hard drive navigation system - and the Bose surround sound system, with handsomely illuminated woofers up front. 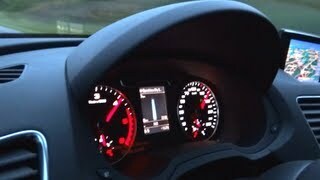 In the near future, an online Bluetooth car phone will follow, paired with a WLAN hotspot to provide the Audi Q3 with full Internet connectivity. This compact premium SUV by Audi will roll off the assembly line with three different four-cylinder engines: one TDI and two TFSI units. All three will combine direct injection with turbocharging, and will feature not only an energy recovery system but also a start-stop system. With power outputs ranging from 103 kW (140 hp) to 155 kW (211 hp), these engines will be as efficient as they are powerful. The basic version, the Audi Q3 2.0 TDI, is scheduled to appear a little later and - with 103 kW (140 hp) and front-wheel drive - will average less than 5.2 liters of fuel per 100 kilometers (45.23 US mpg). The most powerful gasoline engine and diesel engine, respectively, will be paired with quattro permanent all-wheel drive and a seven-speed S tronic, which switches gears at lightning speed. And the S tronic features an innovation: during coasting, the dual-clutch transmission disengages the clutch and allows the Audi Q3 to roll freely - provided that the driver has selected efficiency mode in the optional Audi drive select system. This measure also boosts fuel efficiency. Drivers can use the four modes of Audi drive select to have various systems adjust to their individual driving style; these include engine management and the optional adaptive dampers. The chassis of the Audi Q3 - featuring a four-link rear suspension, electromechanical power steering, and robust wheel brakes - is the fruit of great design labor. The hold assist function is an available option; down the road, the hill hold assist system will be made available. Audi offers twelve different colors of paint for its new compact SUV, and five customization options are available regarding add-on parts. In addition to the standard black add-on parts, customers can choose either a full paint finish or color-contrasting add-on parts in anthracite gray for the underbody guard and wheel arches. The Audi exclusive off-road styling package gives the Audi Q3 a broad and powerful look. The S line exterior package, conversely, represents classic Audi and appeals to especially sporty customers. 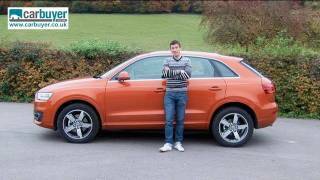 Numerous high-end options attest to the excellent technological standards of the Audi Q3. They include an on-board computer with efficiency program, an ambient lighting package with a great many LEDs, a panoramic glass roof, a storage package, sports seats, electrically adjustable and heated seats, a convenience key for entering the vehicle and starting the engine at the touch of a button, two-zone deluxe automatic air conditioning, tinted rear windows, and a three-spoke leather steering wheel in a new Q-specific look. Adaptive light technology for the xenon plus headlights and the high-beam assistant intelligently illuminate the dark road ahead. The 2.0 TFSI delivers either 125 kW (170 hp) or 155 kW (211 hp). The more powerful version propels the Audi Q3 from zero to 100 km/h (62.14 mph) in 6.9 seconds and on up to a top speed of 230 km/h (142.92 mph). The 2.0 TDI is available with 130 kW (177 hp); a version with 103 kW (140 hp) is to come a little later. Paired with front-wheel drive, the version offering 103 kW (140 hp) averages less than 5.2 liters of fuel per 100 kilometers (45.23 US mpg). The Audi Q3 2.0 TDI with 103 kW (140 hp) will roll off the assembly line with front-wheel drive and - just like the Q3 2.0 TFSI quattro with 125 kW (170 hp) - with a six-speed manual transmission. The 130 kW (177 hp) TDI engine and the 155 kW (211 hp) TFSI combine quattro drive with a dynamic seven-speed S tronic. Gears can also be shifted via optional paddles on the steering wheel. When a driver selects efficiency mode in Audi drive select, the S tronic disengages a clutch while the sporty SUV is coasting and allows it to roll freely - which further enhances fuel efficiency. Audi drive select is available as an option for all Audi Q3 engine types. It accesses the accelerator and steering. When ordered with the equipment options S tronic, adaptive light and Audi adaptive cruise control, these are influenced, too. The driver can vary the function of these systems between the comfort, auto, dynamic and efficiency modes. In efficiency mode, the air conditioner and cruise control operate with the specific aim of saving fuel. The Audi Q3 leaves the factory with 16-inch lightweight alloy wheels fitted with 215/65 tires; the top-of-the-line engines are available with 17-inch wheels. Upon request, Audi can supply wheels between 17 and 19 inches, some of which are quattro GmbH products. All tires are distinguished by low rolling resistance; the brakes are strong and stable - and ventilated at the front. Thanks to its generous ground clearance of 17 centimeters (6.69 in), the Audi Q3 can also tackle rough terrain. Audi will provide a full range of infotainment technologies for the Audi Q3. The connectivity package, for instance, includes the Audi music interface for integrating mobile playback devices and a GPS interface, which the customer can activate at once or at a later date. At a later date, it will become possible to link the MMI navigation plus system with the online Bluetooth car phone, which integrates a UMTS module. And thanks to Audi connect, the Internet will be on board the Audi Q3 - including special services. A WLAN hotspot enables mobile terminal devices so that passengers can enjoy unrestricted Internet connectivity on the road. Assistance systems for the Audi Q3 also come from higher-end model lines. Audi side assist employs radar to help drivers change lanes and Audi active lane assist helps drivers remain in their lane by slightly correcting steering, if necessary. The optional driver information system's screen shows important road signs thanks to the camera-based speed limit display. The Audi Q3 - which will roll off the assembly line in Martorell, Spain near Barcelona - will go on sale in June 2011. The basic price in Germany for the basic version will be 29,900 euros.